Joan was made, can she make a difference? Joan Fasces has been raised as an Evolved (natural) human. On her 18th birthday, her Status meeting blood test reveals that she’s actually a Throwback, a clone of Joan the Arc. Her entire life is turned upside down and sideways. Clones are subjected to intense racism, and her planned medical career, her schools available, the places where she’s allowed to go – restaurants, hospitals, police stations, bathrooms, etc. – all change dramatically. Suddenly, rather than being a popular girl in a good neighborhood and school with a bright future as a doctor, Joan is shunned and shunted off to an academy for Throwbacks. Even worse, Joan faces racism from other clones. She’s a second-class Historical clone, cloned for who she was more than what she was good at. The highest class of clones are Einsteins, Marilyn Monroes, Brad Pitts, Elizabeth Taylors, etc., cloned for their brilliance and skills in engineering, science, acting, singing, and the like. The lowest class of clones are Macs, Mollys, and other low skill servants cloned for their subservient personalities. Joan struggles because the other clones resent her because she was raised Evolved by her well-to-do Evolved surrogate parents. And while Joan’s parents love her, there’s a lot of complexity there that feels real and personal, and Joan struggles with that relationship. All the real Joan of Arc did was lead a revolution. Joan, as her clone, has nothing to contribute in this high-tech era, other than study to be an actor so she can play the part of her progenitor if someone makes a movie about Joan of Arc. As Joan is forced into the lower ranks of this segregated society, she quickly learns about the rules, punishments, and prejudices for her new class. And from her roommates and the teachers at the school, Joan learns a lot of hard truths about racism, addiction, exploitation, human trafficking, prostitution, poverty, degradation, and more. But she also discovers that other clones at her academy have past leaders as their progenitors. Why this sudden interest in leaders of the past? I’d rate Joan the Made four stars because I find some of the plot devices – love triangle, etc. – very average. 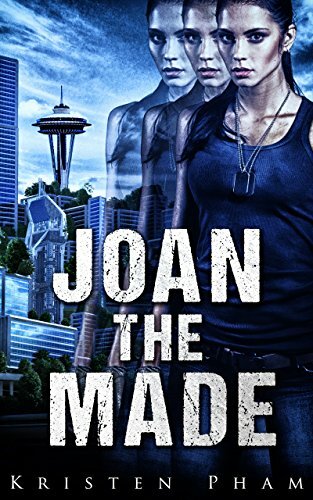 But Joan the Made rises above the norm by addressing very real questions and social issues in an original and engaging manner, so I’m adding a star, and I will definitely be reading the sequel. Recommended with a warning for cursing, sexual violence, and predation. The cursing fit with the characterization, seemed natural, and was not excessive, but I know some are bothered by that. Others might be triggered by the sexual violence, although for the most part it was not graphic. Just a warning for those who are triggered. Follow Joan as she decides whether to run from her fate and spend the rest of her life in hiding, or to join a Throwback rebellion populated by clones of the greatest leaders in history. Her decision will lead her down a path of intense danger, new friendships, and epic love.